Roll the phone (or watch) roll around long (Y) axis and back to toggle the PAUSE button on the music player. 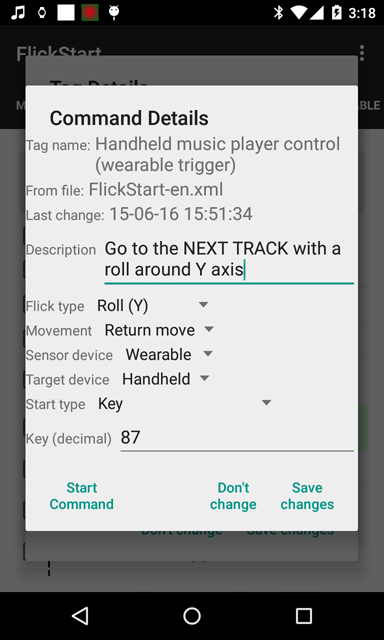 Move the phone (or watch) right and back again to do a NEXT TRACK operation on the music player. 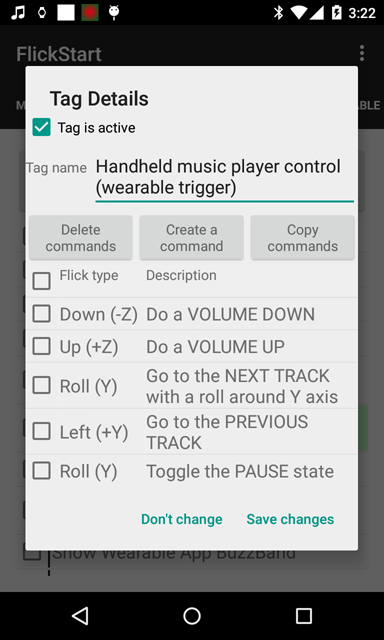 Move the phone (or watch) left and back again to do a PREVIOUS TRACK operation on the music player. Move the phone (or watch) up and back again to do a VOLUME UP operation on the music player. Move the phone (or watch) down and back again to do a VOLUME DOWN operation on the music player. 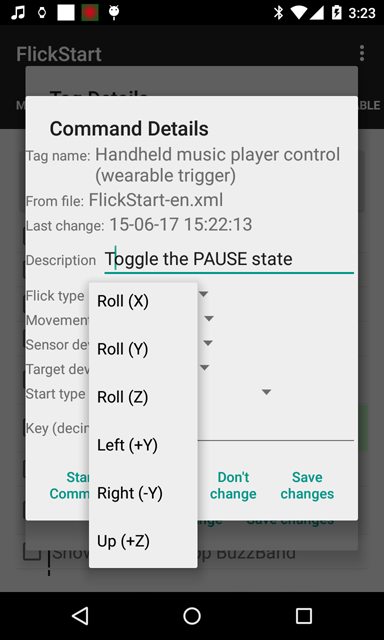 You can turn the FlickStart music player controls on and off and modify the commands. These things are described below. 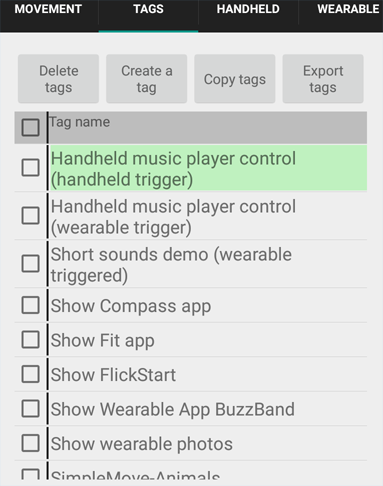 You can see two command sets for the music player, one set responds to movements of the phone (handheld trigger), while the other responds to movement of your AndroidWear watch (wearable trigger). You don't need to have the phone or watch screen on for the commands to be active. 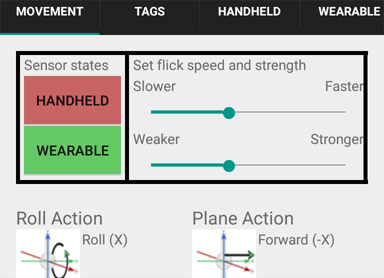 One more save button and we are done ready to use the new movements. You will find that getting a reliable result when you want one will require practicing the moves. 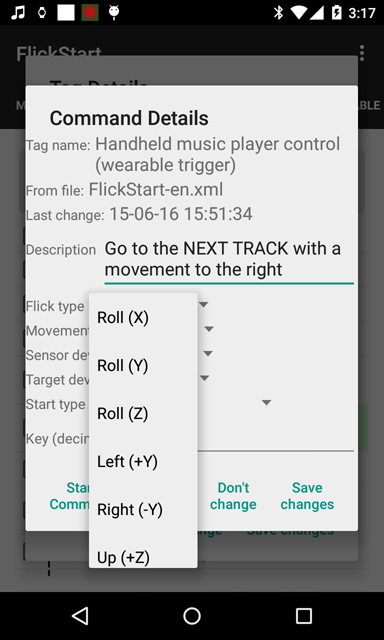 The best way to practice is to have the FlickStart program open on the 'MOVEMENT' tab while you practice (even if you are doing moves with your watch). If you do a move which FlickStart recognizes, a screen will pop up with a green background. If the move was close but not close enough a screen pops up with a red background. Sometimes you will see a green pop up but for a different move. 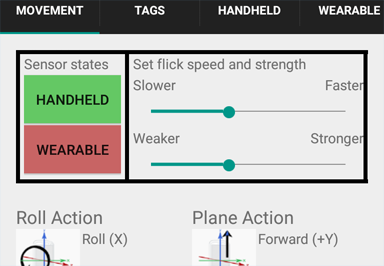 FlickStart can get confused if movements are not sharp enough. Gentle moves are likely to be difficult to work out. 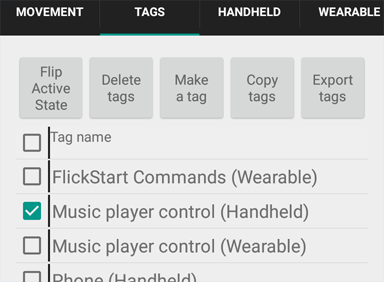 Not all music players are going to work perfectly with these commands. Testing a few music players produced a mixed bag of results. For most, the PAUSE worked as expected in most situations. If there were problems, they varied greatly from music player to music player and sometimes results were variable within one player depending on whether the screen was on or off. 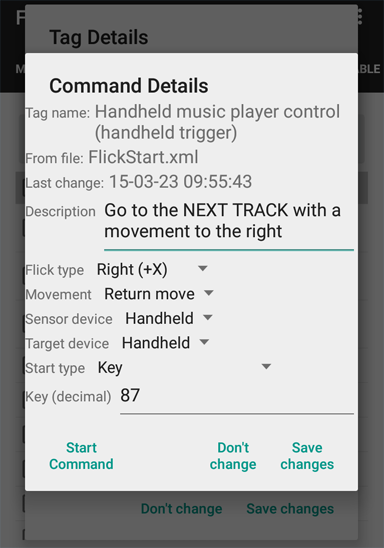 If your favorite player does not work properly with the commands here, you need to tackle the supplier and see if they have any hooks that can be triggered from FlickStart. They will understand the issues and know if something can be done.